Mix @ medium speed - beat butter and sugar until light and fluffy. Beat in milk, vanilla, and salt. Mix @ low speed - beat in flour. Stir in almonds. Wrap dough in wax paper. Chill 3 hours. Shape into 2 inch fingers, place on ungreased sheet. Bake 15 min @ 325 F. Cool on wire racks. In double boiler over hot, not boiling, water, melt chocolate with shortening. 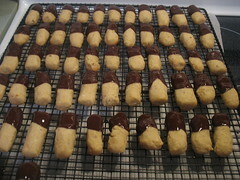 Dip end of cookies in chocolate. Let dry on racks. Store in loosely covered containers at room temperature.